Meditation might very well be the most ancient form of healing. Until recently, all who practiced it knew that it worked, but didn’t how or why. But not anymore. The past 10-20 years of ground-breaking technological advancements in our society has brought with it never-before seen abilities in the realm of brain imaging and monitoring. Scientists have finally been able to really study what happens to our brains when we meditate, and the results are transforming the reputation that meditation has within our society. When it comes down to the science, there really isn’t a part of the brain that’s not affected during meditation. It literally changes our brains’ structure and electrical signaling. In 2014, the University of British Colombia conducted a massive meta-analysis of all the recent and past scientific publications about how meditation affects our brain structure. We’ve pulled out just a few of the outstanding results for you. The brain structures below experienced statistically significant enlargement and increase in activity in meditation practitioners compared to people who don’t practice. Our hippocampus: the part of our brain that facilitates context-dependent emotional responses, spontaneous creative thinking, and most importantly memory recall. When our hippocampus is firing at a higher rate, we are better able to calmly and intelligently respond to emotionally stressful situations, having a very profound effect on our stress management. In addition, when reminiscing on stressful memories, we are able to creatively redirect the emotions associated with those memories. Memories that were once a source of major anxiety and pain are put into a new context and are no longer so overwhelming. Our prefrontal cortex: the part of our brain associated with metacognition (higher level, transcendent consciousness) and our ability to plan and enact a sequence of tasks toward a desired goal. When this is working better, the barrier between plans and actions diminishes, allowing us to productively work towards our goals. Our insular cortex: the part of our brain that is involved in our internal and emotional homeostasis (aka our limbic system). When this structure is firing at a higher rate, our body’s autonomic nervous system is working more efficiently at maintaining our basal body functions such as breathing, blood pressure and cortisol level regulation. Okay, so meditation literally changes our brains structure, but what does it do to the electrical signaling? Turns out, when we are meditating effectively, we slip into what’s called Theta state, which is a certain frequency range of our brain’s electrical signals (4 – 7 Hz). In Theta state, our body becomes deeply relaxed and enters healing and repair mode. This is the whole goal of meditation, it is the absolute perfect healing, restorative calm. What’s the Problem to Solve? While it’s an ancient practice, meditation has seen a huge resurgence in today’s modern society for a whole host of reasons: escape from reality, stress management, metaphysical exploration, etc. But for all of us who pursue this enlightening practice, there seems to be a common, unavoidable hurdle at the very beginning that is the biggest source of discouragement – It is remarkably difficult to calm and relax our mind enough to even enter a meditative state. We live such crazy and hectic lives, our brain’s running just short of light speed, it’s no wonder it’s so difficult to slow down. Nevertheless, this mental control is the central pillar of any meditative practice. How do we get to that healing, restorative, calm Theta state that has a potentially profound effect on our mind, body, and soul? This is where the Light Labyrinth™️ can help. What is the Light Labyrinth™️? 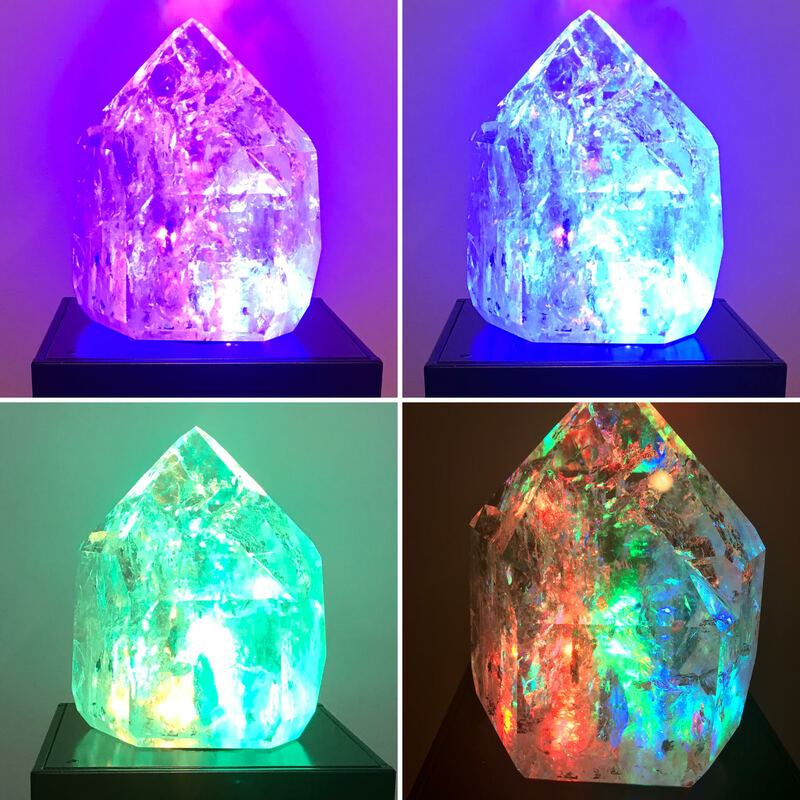 The Light Labyrinth™️ is essentially a huge, beautiful quartz crystal. It sits atop an LED platform that generates colorful and dazzling light patterns up through the crystal. When this light passes through the numerous, dynamic planes and fault lines ridden throughout the stone, the visual effect is nothing short of hypnotizing. What can the Light Labyrinth™️ help you with? Remember that meditation hurdle mentioned a second ago? Yeah, the Light Labyrinth™️ completely dissolves that issue. Once you give this enchanting crystal your undivided attention, within seconds you’ll feel your mind loosen, relax, and slip into that meditative state that so many crave. How will your experience at Infinity Healing be unique? At Infinity Healing, the Light Labyrinth™️ is used with the Biomat and healing, meditative music. The use of all three puts you into a higher state of consciousness and helps with chronic stress, insomnia, anxiety, and for any meditative purposes. You essentially lie back, get warmed to your core, listen to healing music, gaze upon the Light Labyrinth™️, and let your mind transcend. Is meditation associated with altered brain structure? A systematic review and meta-analysis of morphometric neuroimaging in meditation practitioners. Desrochers TM, Chatham CH, Badre D. The necessity of rostrolateral prefrontal cortex for higher-level sequential behavior. Neuron. 2015;87(6):1357-1368. doi:10.1016/j.neuron.2015.08.026.